It's 08:06 in Oía (Santorin), Greece right now. Mystique Hotel A splendid HD view from the Mystique Hotel. 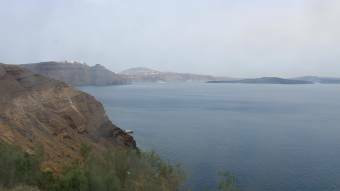 Santorin: The view of the Santorini Volcano, 5.7 miles away. Santorin: Firostefani Settlement, 5.7 miles away. Santorin: Voreina Gallery Suites, 5.7 miles away. Folegandros: Anemomilos Apartments, 27.8 miles away. Mikri Vigla (Naxos): Beach View, 38.9 miles away. Piso Livadi (Paros): Livestream Piso Livadi Beach, 40.3 miles away. Naxos: Apollo Temple Portara, 44.5 miles away. Chora Naxos: Port of Naxos, 44.5 miles away.